Why a new thread you ask!? 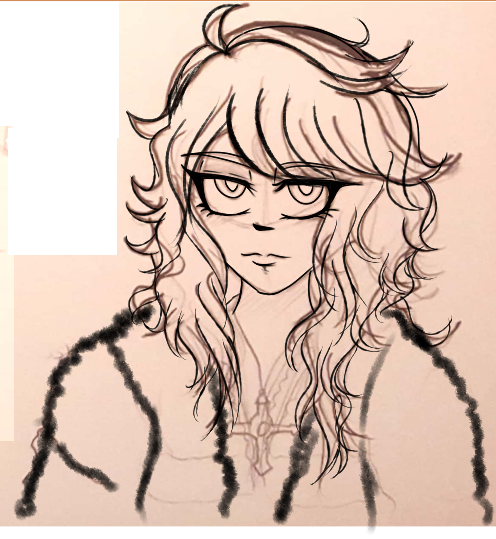 Well, the current one is 4 years old and I want to have a fresh space to post my new art in and be easily able to look at it once the year is up: that way I have a way to see how much I've progressed in one year compared to four. One of my resolutions was to grow my artistic skills by doing all kinds of things to go out of my comfort zone so this is a big step forward. I'll still leave the old one up, but I think I'll just close the thread and naturally let it fall to the bottom since it has too much meaningful content to deserve getting stuffed into the old graveyard. -Devil's Dishonor: Recently renamed from being 'Gossamer.' Check out the story in Modern INKers for the synopsis and story so far ya hooligan. I'll be dumping the art and designs for it here, but I will have a curated archive of it up later. -Spirited Embers: A pokemon fanfiction about a kid named Satomi who starts out in Sinnoh as a trainer. Be nice to her, she's 12. 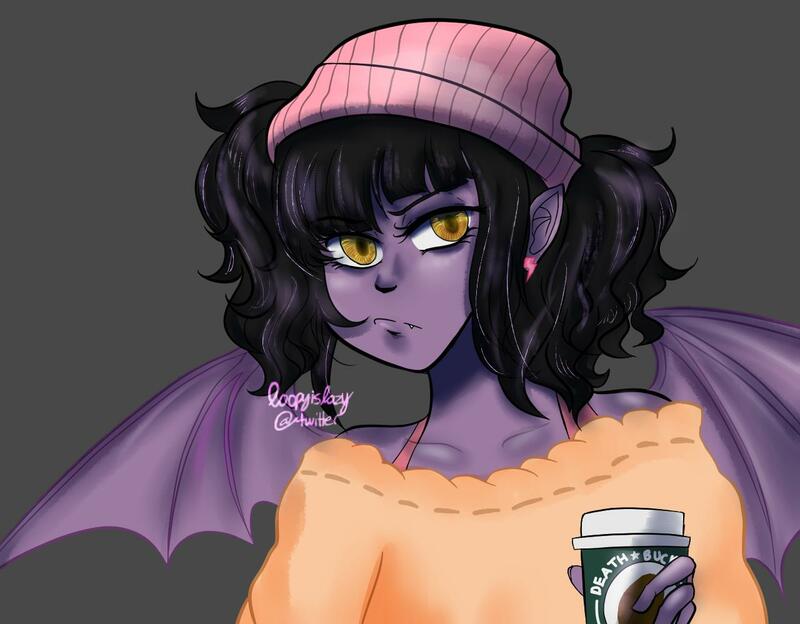 It's on hold but I enjoy drawing her, so you'll be seeing some art for it here and there. -Cielo and Freya (proper title TBA): Their story takes place in Manhattan around 2052; New York was one of many parts of the country ravaged by nuclear weapons in 2025, most of the state remaining uninhabitable for humans due to radiation exposure. Cielo and Freya are among the children born ~20 years later with mutations granting them strange powers as a result of the radiation exposure their parents received. They live in the Manhattan Exclusion Zone with other people like them isolated from everyone else. The kids basically go on adventures around the junkyard and stuff. This is my pet project that I've been keeping under wraps for the past year or so aside from an occasional drawing. The story has a proper name, but I don't really want to share it bc it's my little world for the time being lol. But I love drawing these two, so the least I can do is post art with some short comics of them. They are not chronological, so I don't see a reason to make it their own separate thread, but maybe I will do so if there is enough interest. -Galactic Ruins: Currently a space RP I'm running, not its own independent story. Most likely i'll be posting concept art and any RP related art. 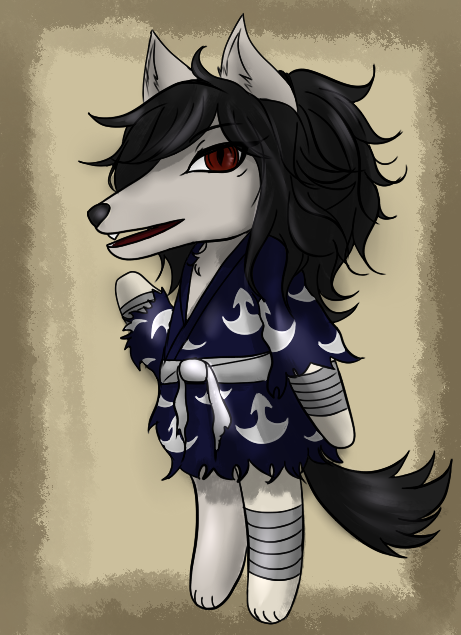 I'm a big fan of Dororo's 2019 anime, and I was throwing around some cute AU ideas with others in the Dororo fan-Discord server when we came up with cute ideas for the characters if they were in animal crossing... so I designed Hyakkimaru as a Wolf. Dororo will get a mouse design soon enough while Hyakki's brother Tahomaru will get a different wolf design. Fanart of Lain Iwakura from Serial Experiments Lain. It's a weird show but I think it's pretty interesting trying to piece together everything and watch the next episode tear your working interpretation completely apart. The show makes little sense to me storywise atm but I do understand the different questions about technology and humanity that it poses. I've been kind of on a kick with 90s anime/manga that didn't take off til decades later these days. 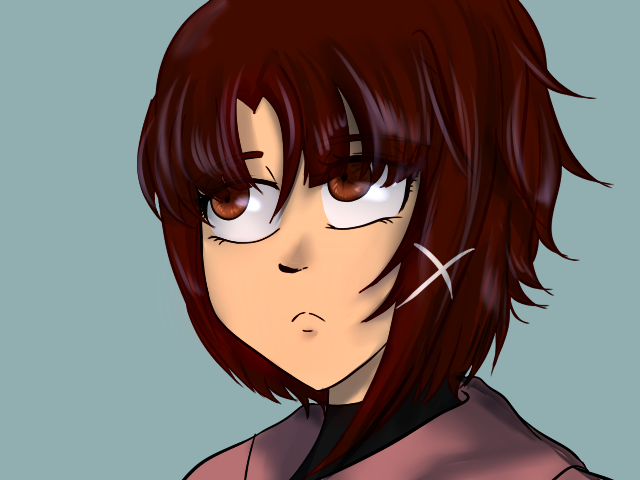 Also, the art style makes Lain have a big head with a lot of space around her nose and mouth so I tried to make it look like her as much as possible. When she looks directly at the camera with her big eyes in episode 1, it kinda creeped me out with how vacant her stare looked, which is why she doesn't look too expressive here. I find her eyes kind of creepy in general for some reason. My entry for the Lunar comp actually is a lot of layers, but I wanted to post my progress sketches that led to the final product. 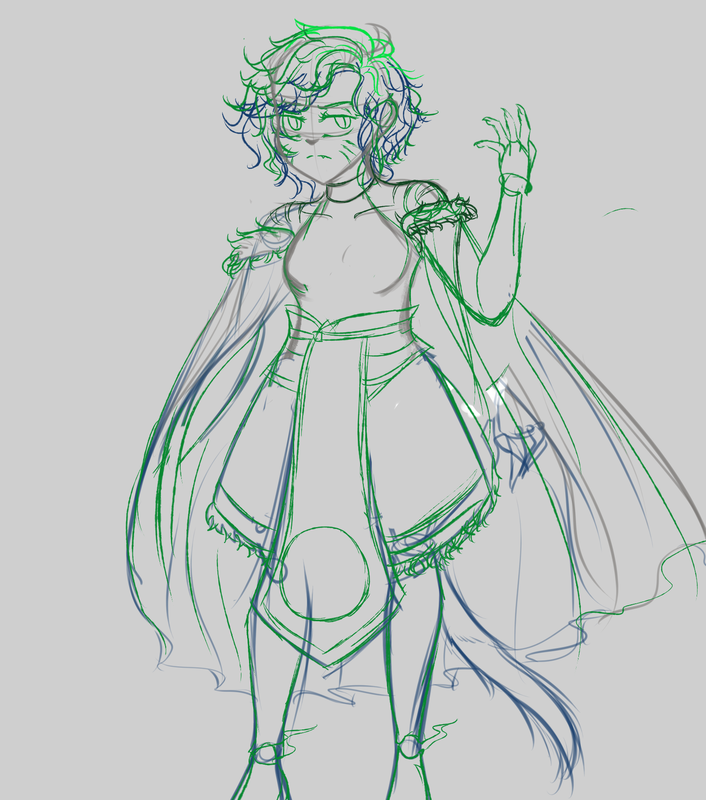 I do not thumbnail my drawings for fullbody art like this; time and again I attempt it and usually I don't get anywhere when trying to take that teeny sketch and somehow work it out to full size. Instead I tend to sketch out VERY ROUGH skeletons consisting of circles and lines for basic skeleton/joint placement using a marker tool, which I usually erase after I make the actual rough sketch on a layer on top. But you can spot some here and there. That isn't to say thumbnailing is not useful, as it works for lots of people! It just doesn't work for me. So I do.... anti-thumbnails. lol! But I did use references for some parts of the posing. 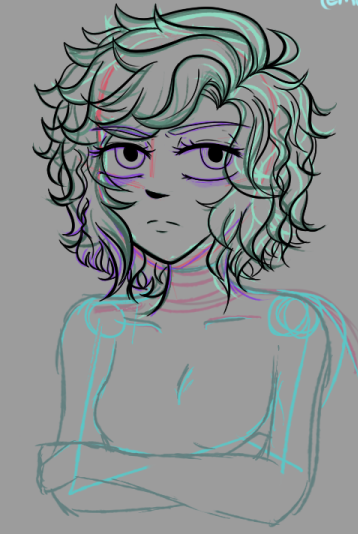 There are different colors because my brain cannot process which lines are going where during the linework if the sketch is entirely in one color. Gray was used for the chest and head, but as I refined details and finalized the design, I changed from blue to green. As you can see, I added and redid some things. 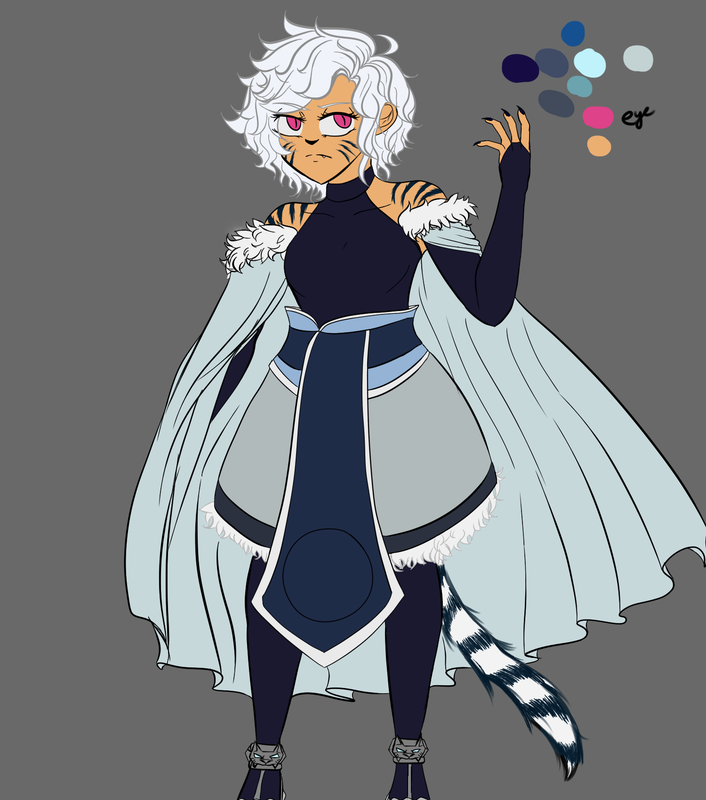 Namely the right sleeve thing because I realized the older wraparound sleeve idea just didn't make sense with it being a cape kind of thing. I tried to make it evident she has a thumb here, and a tiny part of my thumb peeked out in this pose, but it just didn't work! Ugh. I kind of hate the knuckles, but giving her long nails made the finger width sort of bearable. Here is where I added the effects. Tbh I go on autopilot here and just kinda let my brain do the work while I space out. I've never been very good at pattern design like the kinds you see on intricate robes, so I kept it simple while trying to make something original. The main inspirations for some of the design choices were of the concept art of Zhuque Mercy and Baihu Genji by Qiu Fang. I wanted to do the neat spirit seal thing like the skins have so I eyeballed the Baihu symbol that was on Genji's armor. Keep up the good work Loopy! 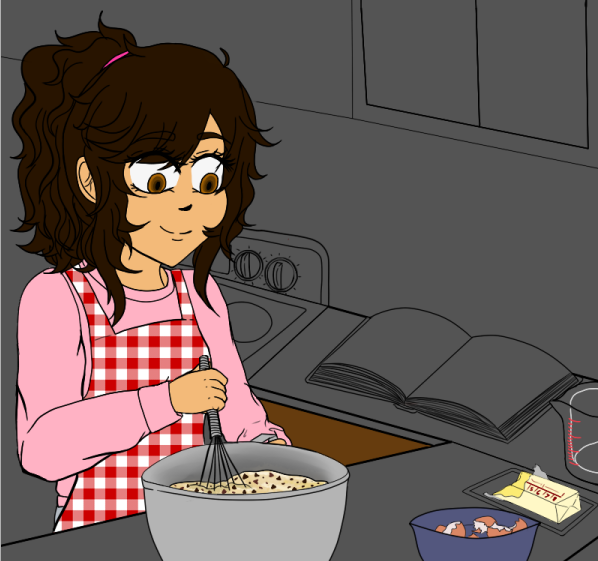 It’s super fun to see everyone steadily improving on their art!